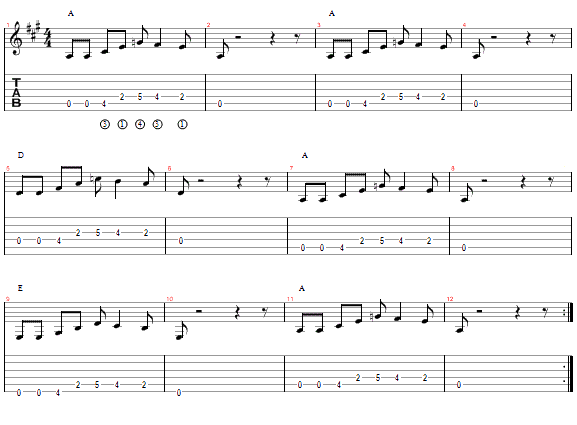 This is the intro riff to the Beatles song "Birthday". You then have to count three beats of silence before playing the riff again. Count - 2 - 3 - 4. On the soundfile I have put in a hihat on these beats. Note that the last note of the riff is a stopped note - you have to pluck the string and then touch it with your finger to stop it vibrating. Once you have learned the riff on the first pair of strings (strings 5 & 4) you simply move across to the next pair and play exactly the same sequence. Use all upstrokes with your right hand. Use a finger for each fret with your left hand starting with your first finger at fret 2 - so your third finger gets all the notes on fret 4 and your fourth finger gets all the notes at fret 5.